My little Max made Mexican dinner the other night. The highlight was guacamole, since he loves avocado. Making dinner for the family was on his school list of things and chores to do at home, everybody in his classroom had to do 7 things from a list of 10, and I think that he did pretty well :-). 4 I don't like it spicy, I want to taste the avocado, not the chili. Fussy ehhhh!!! 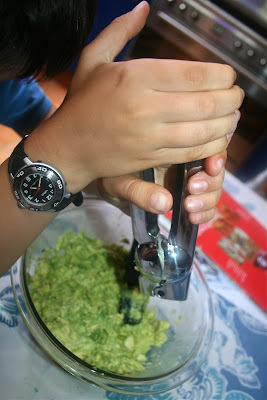 So I gave Max all the ingredients for a garlic and cilantro smooth guacamole. Finally he chopped the cilantro in my hollow herb chopping board (it comes with a curved herb knife which is quite easy to use). He likes doing that. He added the salt, to taste, and that took a while (he was adding about a grain at the time, just to be safe). Taaaa Daaa!!! It was lovely! It was part of a roll your own tortilla meal: warm tortilla, refried beans (these came from a can, just had to re-heat them) sliced tomatoes, grated cheese, guacamole and chili sauce (from a bottle). I prepared it all, and we all enjoyed it. 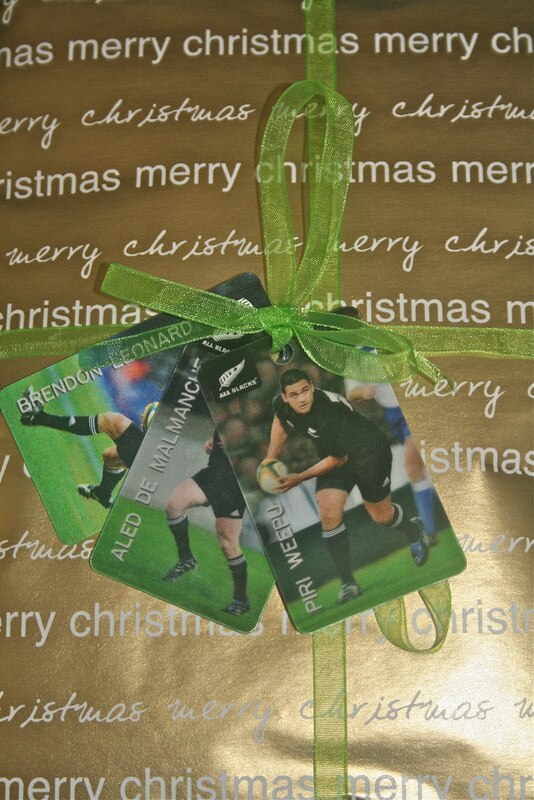 And finally, the Xmas idea of the day: wrapping present for boys with tags made out of rugby players cards: this is going to Japan, where they love the All Blacks! What a wonderful list of things for a young boy to do, especially making dinner for the family. The guac looks delicious. 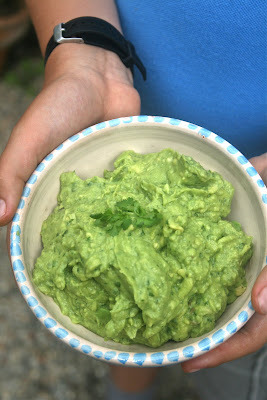 Pagno ed io, ogni giorno aggiungiamo nella nostra max insalata un avocado...lo adoriamo! Bravo Max, che bello quando anche ai maschietti piace la cucina! This looks delicious. 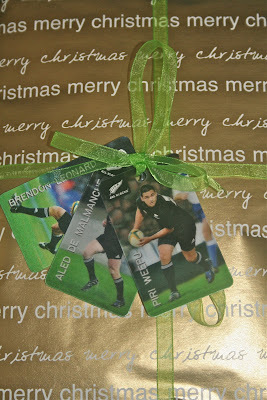 I really like the idea of using boy's cards for gift tags. You're lucky to have a little boy like Max to make Mexican meal. Very cool! I can only imagine how proud you must feel. 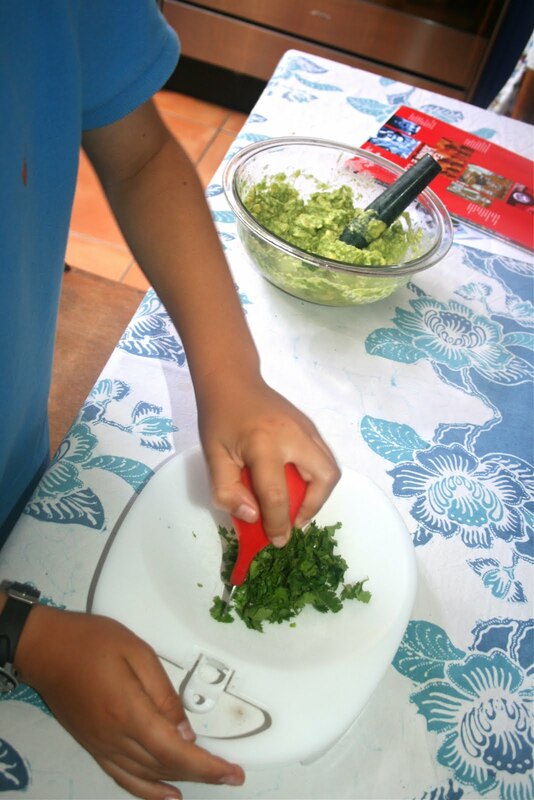 "Wrap your own" night is very popular around our house too, especially because it means I can slip in one topping that might be a little intense for kids and they can satisfy themselves with all the more straightforward choices.